So, what’s a mom to do? 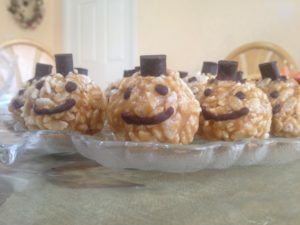 I scoured Pinterest and magazines and here are some of the treats we made. They’re easy and fun to make. I promise. 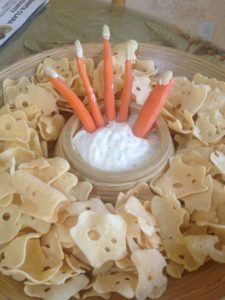 In my previous post, I showcased carrot fingers and I had to do it again… come on, they’re awesome! Apple Fangs! How cute are they? This is one that your kids can help with. Cut apple slices. 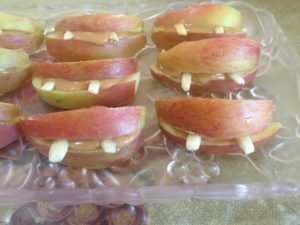 Between 2 apple slices spread some nut or seed butter and stick some almond slivers in for teeth. 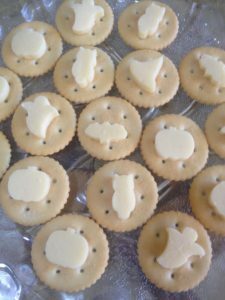 Even cheese and crackers (we like Late July organic crackers for something like this) get the Halloween treatment. My daughter enjoyed helping me cut out the shapes in cheese. 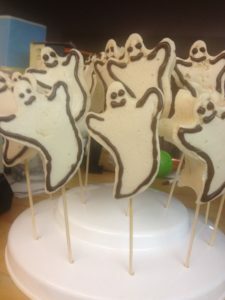 Marshmallow ghosts with a little Enjoy Life Chocolate piping. I’ll post my marshmallow recipe soon! It’s super easy and uses maple syrup instead of corn syrup. I made a tray of marshmallows and then used a cookie cutter to cut out ghosts. Then I melted some Enjoy Life chocolate chips and piped the ghosts (so people could tell what they were). Nut butter rice crispy pumpkins. This is a great recipe and has tons of flexibility. I just rolled them into balls, add an Enjoy Life Semi-Sweet Chocolate Mega Chunks on top. Melt some chocolate chunks and pipe smiley faces. The eyes make my cupcakes look festive. Wait till the last minute. 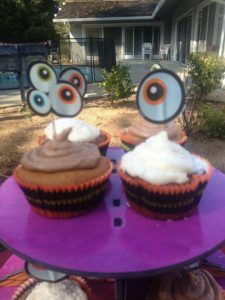 Halloween baking decorations are half price way before Halloween! I usually make these amazing chocolate cupcakes. They’re made with almond flour and are seriously one of the best recipes out there. The recipe is for Elana’s Pantry Easy Black and White Cake, but I use all Enjoy Life chocolate and no white chocolate. These snacks and treats are far from professionally made, but were made with love! 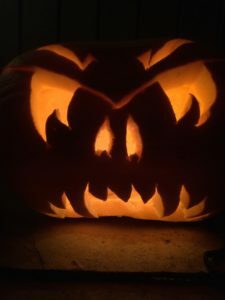 I think most people got a kick out of everything and most people giggled at the treats. I view that as a win for this mom!